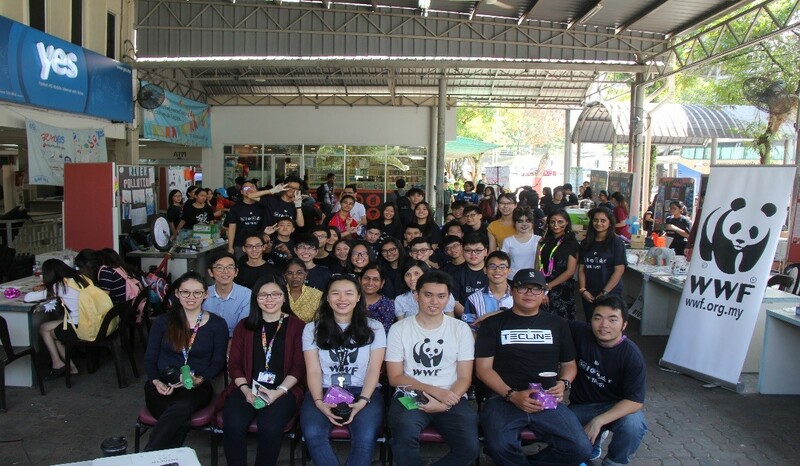 The whole team of students who had participated in the event, with the WWF-Malaysia representatives (Front row, third and fourth from left). Venue: Canteen 2 (Yum Yum Cafeteria), Main Campus TAR UC. 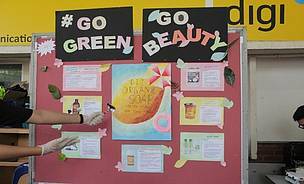 The Department of Bioscience, Faculty of Applied Sciences organised a two-day event entitled “Walk Towards A Better Environment” in collaboration with the Chemistry & Biology Society. 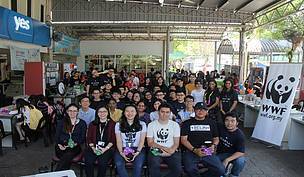 This event was organised and hosted by Diploma in Science (Chemistry and Biology) (DCB2) and Bachelor of Science in Bioscience with Chemistry (RBS1) students in line with their course Biodiversity and Ecology. 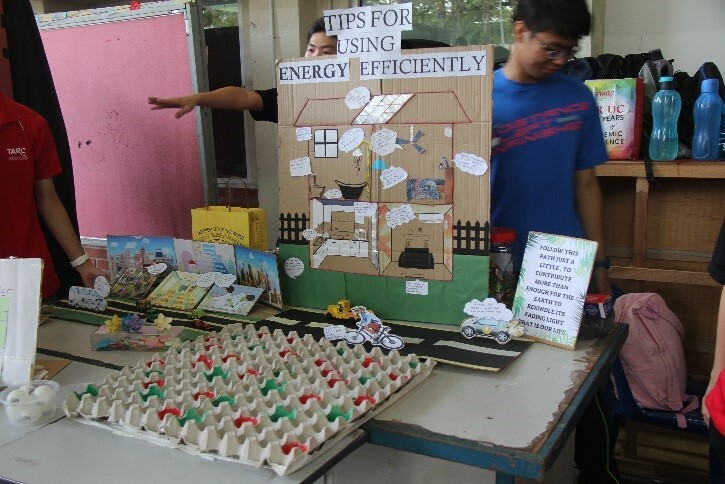 The aim of this event was to stimulate the students to use the knowledge gained to create awareness of the importance of maintaining and conserving the natural environment. 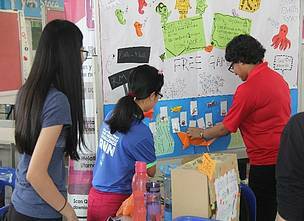 The students had set up 10 booths to display various environmental themes using a creative, colourful and informative approach to present issues pertaining to pollution, conservation of marine life, green and energy conservation, waste management, coral reef conservation and many other environmental issues. 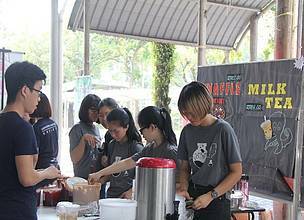 This two-day event featured many activities including talks, face and hand painting, photo exhibitions, games, quizzes, music performances, food stalls and many more. Besides that, NGOs such as World Wide Fund for Nature Malaysia (WWF-Malaysia), Project Aware PADI and Malaysian Society of Marine Sciences (MSMS) also participated in the event. 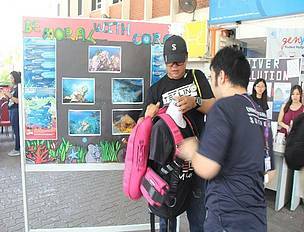 Representatives from WWF-Malaysia, Ms. Ivy Ong Mei Ling and Mr. Ooi Sheng Cheing had set up a booth and presented a talk entitled “Conservation of Tigers in Malaysia”; Project Aware PADI representative Mr. Jack Yap from Sabah also shared his experiences as a deep sea diver and how he is involved in the conservation of coral reefs in Sipadan, Tioman and Redang Islands. 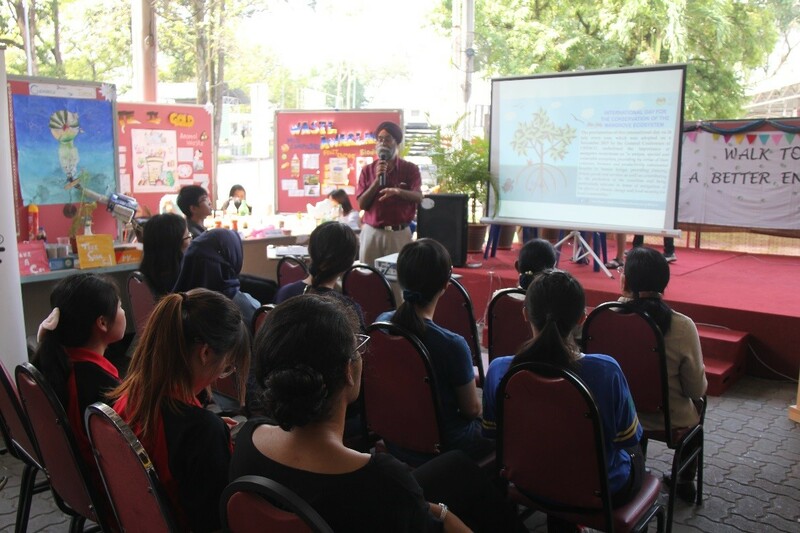 Prof. Dr. Harinder Rai Singh, Senior Lecturer UiTM and President of MSMS also gave a talk entitled “Mangroves and their Importance as Biodiversity in the Malaysian environment”. The students managed to raise RM1200 for WWF-Malaysia despite encountering challenges during the event. The event had honed the students’ organisational, teamwork, communications, problem-solving, creativity and event management skills. It was an eye-opening experience for the students as they were exposed to many current environmental issues and their interest in conserving the environment was stimulated. 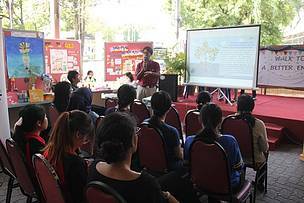 Prof. Dr. Harinder Rai Singh, President of MSMS and Senior Lecturer at UiTM giving a talk. 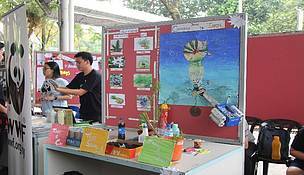 Activities by the students with different themes.